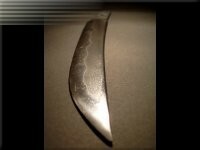 Base material for this Tanto blade was carbon steel CK75 / 1075, thickness 4 mm. 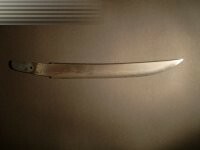 The blade was covered with fireclay mortar - including a coating on the back. 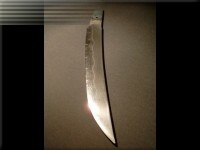 Due to the hardening the blade got a nice curvature and hamon but it also got seven cracks in the edge! 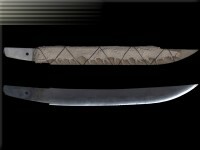 During heating the blade expands. 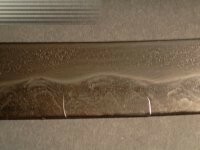 After quenching, the back and middle part goes back to their initial volume - the hardened edge remains with a slightly higher volume. This bending happened after the edge becomes hard and brittle and this is the reason for all cracks. Also a thicker edge and warmer water decrease the danger of crack initiation. Here you can see a close-up view of the cracks. Reason for these cracks was the strong bending during quenching with already hardened edge.